Travel in some parts of the world, or for some people, can be dangerous, but robots may soon change that. Yesterday former-NSA-contractor-turned-whistleblower Edward Snowden “walked” onto the TED stage in Vancouver via BEAM telepresence robot, while safely stationed out of the US government’s reach in Russia. It was the first time Snowden, who was granted temporary asylum by the Russian government last August, had “set foot” in North America since he was charged with espionage and theft of government property by the US government. Said Snowden from his onstage perch: “I can see everyone! This is amazing!” How will lawmakers respond? For disclosing thousands of classified documents that revealed details about the US National Security Agency’s global surveillance programs, and for perpetrating what has been called the most significant government leak in US history, Snowden has been called by some a whistle-blower and a patriot, by others a traitor. That he should grace the stages of a TED conference while in exile would have been no small feet a decade ago. But this is 2014, the 30th anniversary of TED, and as was pointed out by Chris Anderson (who was interviewing Snowden for this event), a lot has changed since 1984: “Today, if you go to look at a copy of 1984 on Amazon.com,” said Snowden, “the NSA can see a record of that. The Russian Intelligence Service can see a record of that. The Chinese Service can see a record of that. The French service, the German service … They can all see it because it’s not encrypted.” I doubt very much that the Orwellian irony of this fact was lost on anyone in the audience, but what about the significance of Snowden’s appearance via telepresence? But in an age of telepresence, what does it mean to be a citizen? … a political refugee? … a dissident? … a fugitive? … a traitor? … or an alleged or convicted criminal? How does robotic telepresence technology disrupt our sense of location, boundary, border and space? Though Snowden’s address was focussed on what it means to be a whistle-blower in the age of the Internet, for me it was these questions about identity and boundary that lurked in the background … Will we have laws one day to prevent convicted gang leaders from conducting their business via telepresence on the street? Will countries impose sanctions on each other for allowing cross-border political dissidence? Last month Peter Diamandis introduced Chris Anderson, Curator of TED, to Scott Hassan at Suitable Technologies and encouraged him to use BEAM at TED. Telepresence has been around in various forms for quite some time now but Suitable Technologies has focused on creating an experience that works, that has decent enough quality for both audio and video, and that is robust enough to use an Internet connection. “It is no mystery that there are governments out there that want to see me dead,” said Snowden, as if to underscore the real and present danger he would have faced had he tried to appear at TED in person. 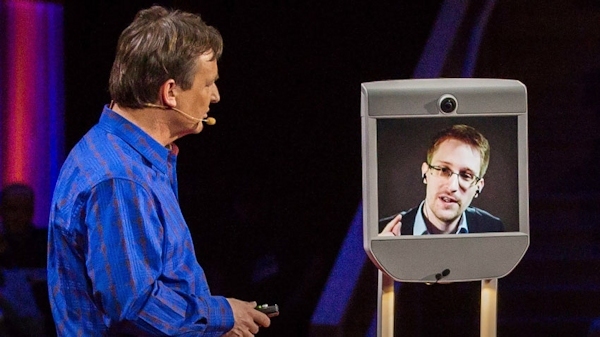 But the risks are indeed less when you can BEAM in: Snowden’s talk comes full circle in telepresence terms because it is the very free access to the Internet he is fighting for that allowed him to engage in disruptive politics at TED. You may be asking yourself how Snowden BEAMing in is different from his (or Assange’s) recent appearance at SXSW via video conference. Indeed this was literally a “staged” event, and the physicality of the interaction was in many ways jilted and forced (note the awkwardly attempted handshake between guest Tim Berners-Lee and Snowden’s BEAM in the video below). But via BEAM, Snowden is far more free to go where he wants (as long as there are no steps); he can navigate towards the people of his choice and engage them in up close communication. Perhaps this is not so obvious from the video of Snowden on the TED stage, but in other circumstances this would be incredibly enabling technology to someone who faces restricted mobility due to illness, distance, or in Snowden’s case, political/legal issues. “The team at Suitable Technologies is always excited to learn about individuals who utilize Beam remote presence for their most important conversations, urgent consultations, and memorable presentations. Now, more than ever before, people are realizing that interacting over Beam Pro has its advantages over traditional video conferencing,” says Director of Marketing Erin Rapacki, Director of Marketing at Suitable Technologies. At one point Anderson asks the audience to indicate by show of hands how many of them believed what Snowden did was a reckless act that endangered America. When only a few raise their hands, Anderson says, “It’s hard to put your hand up when the man is standing right here,” causing Snowden and some members of the audience to chuckle. And yet what Anderson said is true. There is power in presence. Telepresence robots like BEAM are designed for their simplicity and ease of use; you don’t need to be a roboticist to engage with one. As these devices become increasingly accessible and ubiquitous – like the Internet – we are likely to see them, too, used for all means of expression and communication – political, dissident, or otherwise. “Canada is different than I expected. It’s a lot warmer,” Snowden replied. Jokes aside, Snowden’s actual physical whereabouts may have just become irrelevant – as long as he has access to the Internet, he can communicate. And with a telepresence robot, he can also be physically present in any location. He may have grown up “in the internet” but the next generation will grow up inside robots. Watch the TED full video here.